Amalgam Trio: active 2000-2005, then Katt moved to Philadelphia, eventually to Sweden. Amalgamated Broadcasting System, a short-lived American radio network during the 1930s. born in Boston Massachusetts, received his first formal dance training from Jody Weber at Green Street Studios in Cambridge, Massachusetts. At the Dance Complex, also in Cambridge, he studied Experiential Anatomy, Somatic Movement and Contact Improvisation with Debra Bluth. He has appeared with several dance-theater groups, including Callie Chapman-Korn’s Zoedance and Rose-Pasquerello-Beachamp’s inFluxdance, which made an award-winning appearance at the 2006 Montreal Fringe Festival. 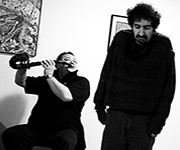 He has performed extensively with experimental and improvisational musicians, and has on-going collaborations with Callie Chapman-Korn, Shayna Dulberger, flandrew fleisenberg, Katt Hernandez, Paul Kafka-Gibbons, Matt Samolis, and Walter Wright. His principle area of interest is intermedia performance, and has worked on many projects with Walter Wright: electrovideomove, Egg Sucking Dogs, dadallamas, bodydrama, and Apocalypso. Joe currently leads ensemble inedit, a movement and sound collective. is a violinist living in Stockholm, Sweden with strong connection to Boston, Massachusetts, Philadelphia, Pennsylvania and Baltimore, Maryland. 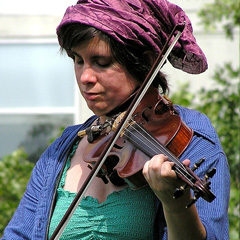 Katt’s violin playing employs many virtuosic extended techniques, as well as microtones. Her influences range a vast gamut of music, and her own work is entirely improvised. She has been noted for her unique playing in many publications and on-line review sites, including Cadence Magazine, Signal to Noise, Arthur Magazine and All About Jazz. She arrived in Boston in 1997, and quickly became a part of the city’s rich landscape of improvised music. She regularly sat in on classes and sessions at the New England Conservatory in her first years in town, where she met her next mentor, Joe Maneri. There she also began her long collaboration with pianist and accordion player Jonathan Vincent. She began working extensively with performance artists, dancers, and video artists as improvisers. In her thirteen years on the east coast, she appeared as a performer throughout the Boston improvised music scene weekly, and in many venues along the East Coast. She has also appeared on a number of festivals of improvised and experimental music, including High Zero, Autumn Uprising, Creative Soundspace, Montreaux-Detroit Jazz, Boston CyberArts and Improvised and Otherwise. She has appeared in performance with Joe Maneri, Joe Morris, Steve Norton, Matt Samolis, Hans Rickheit, Jack Wright, Zack Fuller, Oolanda Denosky-Smart, Saul Levine, Nicole Bindler, Andrew Neumann, Eric Rosenthal, Walter Horn, Dave Gross, Allysa Cardone, Tatsuya Nakatani, James Coleman, John Voight, Joe Burgio, Walter Wright, Dan DeChellis, John Berndt, Adam James Wilson, Marc Bisson, and many, many others. In the early 1970s, he was one of the first video animators. At Computer Image Corp he animated letters, words, and titles for the Children’s Television Workshop. He was a video animator for Ed Emshwiller’s Thermogenesis and Scapemates, aired by WNET’s Artists Television Workshop. Scapemates was the first computer graphics video nominated for an Emmy Award (1971), and Wright showed his work at the first computer art conference at the Kitchen (NYC, 1973). In 1973-76, as artist-in-residence at the Experimental Television Center he pioneered video performance; touring public access centers, colleges, and galleries with the Paik/Abe video synthesizer. Walter develops software and hardware for artists: the Video Shredder, a desktop video processor for the TARGA2000; and Movies, a video optical printer for Truevision’s TARGA+ frame buffer. He assisted in the design and construction of voltage-controlled video modules at the Experimental Television Center, and assembled several modular music synthesizers. Using Max/MSP and softVNS he developed motion-triggered, sound and video for performance. He continues to develop computer graphic and video sketches in Processing. He is currently building an audio video synthesizer. Walter is a co-founder of 911 Electronic Media Arts Inc., and 119 Gallery, 1995-2015.